agregats i partícules per sota del micròmetre. La stishovita és un mineral de la classe dels òxids, polimorf del quars, la coesita, la tridimita i la cristobalita. és un polimorf d'alta pressió; es forma per sobre dels 1200 graus centígrads (C°) i uns 100 quilobars. Se sol trobar en cràters d'impacte meteorític afectats per metamorfisme d'impacte d'alta pressió. La seva localitat tipus es troba al Meteor Crater, Arizona, Estats Units. El seu nom prové de Sergei Mikhailovich Stishov, un cristal·lògraf de l'Acadèmia de les Ciències de Moscou, Rússia, que va ser qui va sintetitzar el compost per primer cop l'any 1962. ↑ 1,0 1,1 «Stishovite» (en anglès). Mindat. [Consulta: 16 juliol 2015]. ↑ 2,0 2,1 «Stishovite» (en anglès). Webmineral. [Consulta: 16 juliol 2015]. Stishov, S.M., Popova, S.V. (1961) A new modification of silica. Geochemistry, 10, 923-926. American Mineralogist (1962): 47: 807. Fahey J.J. (1964), Recovery of coesite and stishovite from Coconino Sandstone of Meteor Crater, AZ. American Mineralogist: 49, 1643-1647. Bohn, E. & W. Stöber (1966), Coesit und Stishovit als isolierte natürliche Mineralien. Neues Jahrb. Min., 89-96. Hemley, R.J., Mao, H.-K., and Chao, E.C.T. (1986) Raman spectrum of natural and synthetic stishovite. Physics and Chemistry of Minerals: 13: 285-290. Ross, N.L., Shu, J.F., Hazen, R.M., and Gasparik, T. (1990), High-pressure crystal chemistry of stishovite. American Mineralogist: 75: 739-747. American Mineralogist (1990): 75: 951. Pawley, A.R., Mcillan, P.F., and Holloway, J.R. (1993) Hydrogen in stishovite, with implications for mantle water content. Science: 261: 1024-1026. Xue, X., Stebbins, J.F., and Kanzaki, M. (1993) A 29Si MAS NMR study of sub-Tg amorphization of stishovite at ambient pressure. Physics and Chemistry of Minerals: 19: 480-485. Mao, H.-K., Shu, J., Hu, J., and Hemley, R.J. (1994), Single-crystal X-ray diffraction of stishovite to 65 GPa. Eos Transactions of the American Geophysical Union: 75: 662. Kingma, K.J., Cohen, R.E., Hemley, R.J., and Mao, H.-K. (1995), Transformation of stishovite to a denser phase at lower-mantle pressures. Nature: 374: 243-245. Lee, C. and Gonze, X. (1995), The pressure-induced ferroelastic phase transition of SiO2 stishovite. Journal of Physics: Condensed Matter: 7: 3693-3698. Dubrovinsky, L.S. and Belonoshko, A.B. (1996), Pressure-induced phase transition and structural changes under deviatoric stress of stishovite to CaCl2-like structure. Geochimica et Cosmochimica Acta: 60: 3657-3663. Li, B., Rigden, S.M., and Liebermann, R.C. (1996), Elasticity of stishovite at high pressure. Physics of the Earth and Planetary Interiors: 96: 113-127. Zhang, J., Li, B., Utsumi, W., and Liebermann, R.C. (1996) In situ X-ray observations of the coesite-stishovite transition: reversed phase boundary and kinetics. Physics and Chemistry of Minerals: 23: 1-10. Lee, C. and Gonze, X. (1997), SiO2 stishovite under high pressure: dielectric and dynamical properties and the ferroelastic phase transition. Physical review B: 56: 7321-7330. Andrault, D., Fiquet, G., Guyot, F., and Hanfland, M. (1998), Pressure-induced Landau-type transition in stishovite. Science: 23: 720-724. Carpenter, M.A., Hemley, R.J., and Mao, H.-K. (2000), High-pressure elasticity of stishovite and the P4 2/mnm ↔ Pnnm phase transition. Journal of Geophysical Research: 105: 10807-10816. Chung, J.I. and Kagi, H. (2002) High concentration of water in stishovite in the MORB system. Geophysical Research Letters: 29, 2020, DOI: 10.1029/2002GL015579. 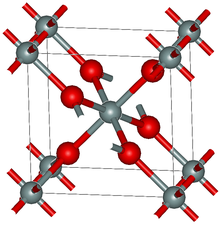 Stebbins, J.F., Du, L.-S., Kelsey, K., Kojitani, H., Akaogi, M., and Ono, S. (2006) Aluminum substitution in stishovite and MgSiO3 perovskite: High-resolution 27 Al NMR. American Mineralogist: 91: 337-343. La pàgina va ser modificada per darrera vegada el 21 maig 2017 a les 17:46.